Translation of mRNA into protein has a fundamental role in neurodevelopment, plasticity, and memory formation; however, its contribution in the pathophysiology of depressive disorders is not fully understood. 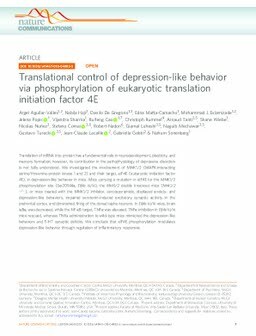 We investigated the involvement of MNK1/2 (MAPK-interacting serine/threonine-protein kinase 1 and 2) and their target, eIF4E (eukaryotic initiation factor 4E), in depression-like behavior in mice. Mice carrying a mutation in eIF4E for the MNK1/2 phosphorylation site (Ser209Ala, Eif4e ki/ki), the Mnk1/2 double knockout mice (Mnk1/2 -/-), or mice treated with the MNK1/2 inhibitor, cercosporamide, displayed anxiety-and depression-like behaviors, impaired serotonin-induced excitatory synaptic activity in the prefrontal cortex, and diminished firing of the dorsal raphe neurons. In Eif4e ki/ki mice, brain IκBα, was decreased, while the NF-κB target, TNFα was elevated. TNFα inhibition in Eif4e ki/ki mice rescued, whereas TNFα administration to wild-type mice mimicked the depression-like behaviors and 5-HT synaptic deficits. We conclude that eIF4E phosphorylation modulates depression-like behavior through regulation of inflammatory responses.